In this, the first of a series of beautiful places that our motorhome and campervan clients have visited in the culturally rich region of Burgundy (where our depot is located! 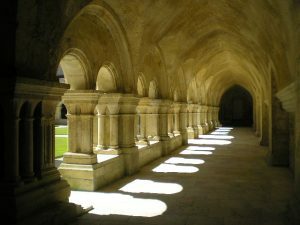 ), we report on Doug and Tricia Conners’ visit to Fontenay Abbey in Marmagne, a 12th century masterpiece, with something to please every age. 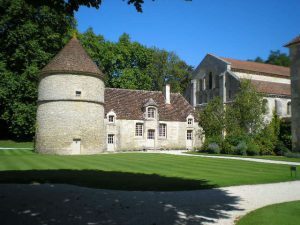 Founded in 1188 by Saint Bernard of Clairvaux, the Abbey de Fontenay is still in very good condition and provides a window into what life was like for the very successful monks of the flourishing Cistercian Order. 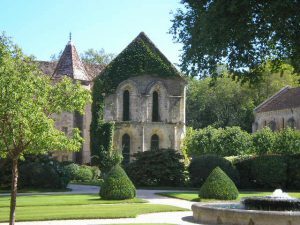 The abbey, which is a UNESCO site, is a stunning place of tranquillity and quiet, as is its location in the Valley of Fontenay, itself a UNESCO Preserved Natural Site. Yet, it’s also a very good place to explore with children, because it’s not too big and you can actually imagine the monk’s living there as it’s in such good condition. The valley is open to all to explore without charge, with three marked walks (45 minutes, 1.30 and 3.30 hours long), including one that was probably the path that St Bernard walked in 1118 en route to finding the location of what is now Fontenay Abbey. If you visit, you’ll understand why the abbey has featured in many films and TV movies, including Cyrano de Bergerac (1990) with Gérard Depardieu. It is in very good condition – the cloister, dormitory and common room could be lived in today and there’s a beautiful garden and fish pools. In addition, the monks are believed to have been the first in the world to develop a hydraulic hammer, which they used to beat out metal from the abbey’s own refinery. You can see pictures of the reconstructed hammer in the original forge here. The Abbey is open every day until 13 November from 10am to 6pm, with several guided tours during the day. Special events (candle visits, extended evening hours) will be announced on their web site. Admission is very reasonable at €10 for an adult or €12.50 for a guided tour, which is well worth the extra €2.50. The Abbey is about 1h 50 minutes’ drive south-west of our depot, between us and Dijon/Beaune. ← Absolutely GORGEOUS compact motorhome!